Your characters are very readable, but I think you wrote the wrong first character. Looks like you meant to write 新 but you only wrote 亲 (the left side of 新). 亲 is like "beloved" or "dear", but 新 is "new" (as in "New year"). Even still, it's quite obvious what you meant. 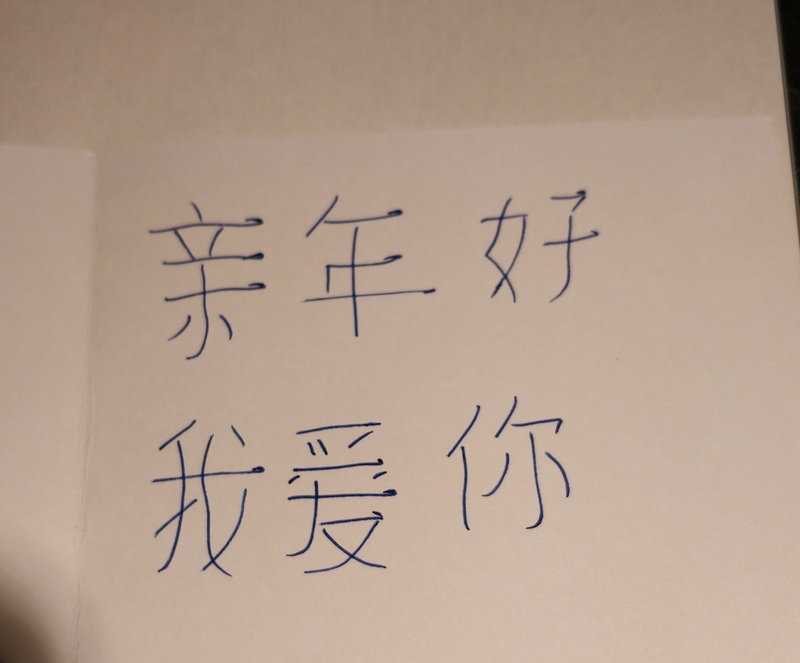 "You also forgot 2 strokes on 愛 if you were meaning to write the traditional form or you have a 2 extra strokes if you were meaning the simplified form (爱)." However, droooze pointed out in the comments that the "extra strokes" are just the left and right pieces of 冖. The fact that they are quite disconnected from the 一 is what had me confused. Absolutely readable! Why did you ask? You did a good job. First character is wrong though. It should be 新 (xin) not 亲 (qin). 新means “new”， 亲means “my dear” or “Love” “babe” or .... many many other meanings but “new”. People will understand it, just a bit fanny. Your handwriting is absolutely readable.